Subodh Kumar Singh was attacked by a mob when he and his team had gone to a village to tackle protests after cow carcasses were found in a forest. Abhishek Singh put out a strong appeal against "mob culture" and "Hindu-Muslim" violence. 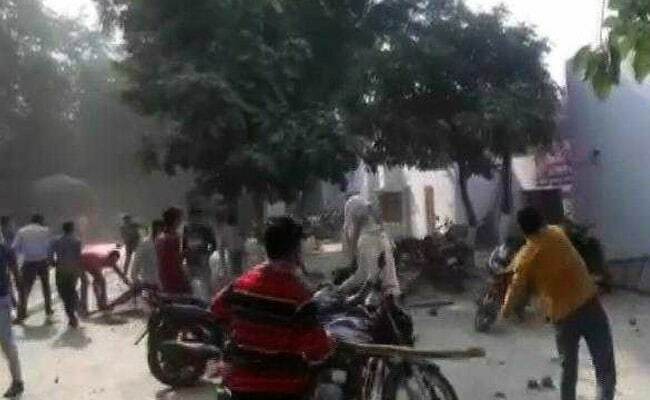 He has put out a strong appeal against "mob culture and "Hindu-Muslim"
The son of Subodh Kumar Singh, the police inspector killed in mob violence over cow slaughter allegations in Uttar Pradesh's Bulandshahr, put out a strong appeal against "mob culture" and "Hindu-Muslim" violence. "Today my father has died. Tomorrow a mob could kill a top police officer. Then someday it will be a minister. Should mob-killing culture be allowed to go on like this? Absolutely not," said Abhishek Singh, speaking to NDTV's Ravish Kumar. "I hope a day doesn't come when we are killing each other within India. Then Pakistan, China or whoever...they would not have to do anything at all." Subodh Kumar Singh was attacked by a mob when he and his team had gone to a village to tackle protests after cow carcasses were found in a forest. The protests had escalated after activists of rightwing group Bajrang Dal came to the area and blocked a road with a truck carrying the dead cows. Subodh Kumar Singh's car was chased to a field and surrounded by a mob, which shot him dead. Inspector Subodh Kumar was killed by the protesters in Bulandshahr on Monday. Chief Minister Yogi Adityanath's security review meeting on the incident focused on action against cow slaughter but nothing was said on the murder of the police officer. "A human's murder is more important than finding out who killed cows. If the Special Investigation Team is filing its report, then it should be clarified where the carcasses came from, whether they were planted to create trouble," said Abhishek Singh. Asked what message he would convey to the chief minister on Hindu-Muslim politics, the teen said: "Not just the chief minister, I would appeal to the entire country, please stop Hindu-Muslim violence. People get violent at the slightest provocation. People should understand and think, that they are bound by the law." Underscoring his message, he said: "My father always used to say whatever else you become, you need to be good citizens first. This country is yours. You people are not comprehending, I request you to understand - this mob culture will give us nothing."